Purchase Weights and Bar together and save up to 19% combined. Collars purchased separately do not ship free. Choose from multiple bar options based on your application. See shipping details on each product above pricing. 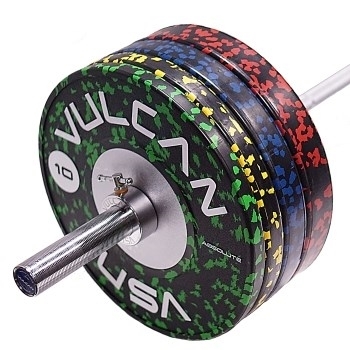 Bumper Plates & Olympic Bars Sets for Olympic Weightlifting, CrossFit, and strength training. For commercial gym equipment or home gym equipment use. Multiple Plate & Bar packages to choose from. If you are equipping a College gym, high school gym, commercial gym or CrossFit and require large quantities please contact us to save on bulk shipping rates. Note: All bumper plate sets, bumper plates & Olympic Bar Packages and other heavy items may ship LTL freight. If you live in an area that is not accessible to a full sized freight truck contact us to make other shipping arrangements to avoid delays. You will be responsible for unloading the items from the truck, not the driver. If you require inside delivery or a truck with a lift gate to deliver, you must contact us for an additional rate quote for these extra services. *Free shipping to the North East, Mid West, and South East regions of the Continental US. For North West and South West regions of the Continental US, a surcharge applies Contact Us if you need a quote for shipping outside the Continental US.